Cameroon got their 2012 Africa Cup of Nations campaign off to a winning start after dispatching Mauritius 3-1 in Group E in Bellevue. Striker Samuel Eto'o scored twice as the Indomitable Lions eased to victory. He put the visitors in the lead on 36 minutes but Jonathan Bru drew the home side level four minutes later. Eto'o grabbed his second two minutes after the break and Eric Choupo-Moting sealed the win from the penalty spot. on the hour mark. The win puts the Indomitable Lions top of the table ahead of the other group game between Senegal and DR Congo on Sunday. The victory was the first official game for new Cameroon coach Javier Clemente, who took charge of the side two weeks ago. 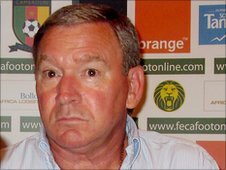 Clemente, who coached Spain from 1992 to 1998 and Serbia from 2006 to 2007, is looking to restore Cameroon's reputation as a top international side after their disappointing first round exit at the World Cup in South Africa.